Reputation management on social media is just as important as traditional customer service tactics. The image you portray to potential and existing customers directly affects if those people will continue to do business with your company. So, how do you conquer any customer feedback that may come your way? Picture this as getting an angry call from a customer and hanging up on them. It’s bad manners, no issue is resolved and the customer is very likely to be more upset than he/she originally was. No one appreciates their word being censored. The customer will notice and it is sure to backfire. As Applebee’s experienced last year after their PR nightmare, removing negative comments on Facebook only worsens the situation. However small a complaint may be, eliminating customer input is bad business. 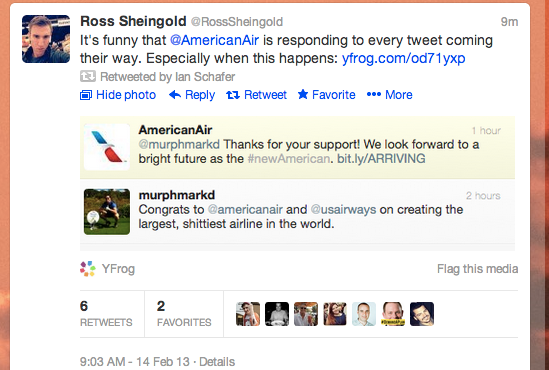 By now, you may have seen companies that have generic auto-replies to certain user tweets. Participating in user conversations about your brand is one of the best things you can do to humanize your brand online, but it should be personalized. As advanced as technology is, auto response programs can’t fully detect the true human emotion behind 140 characters. Whatever bot American Airlines used to respond to user tweets obviously couldn’t detect sarcasm, resulting in a very impersonal response to an unhappy customer. Even if you aren’t using an auto response program, the language you use to respond to customers should not be dry nor appear as if you’ve copied and pasted it hundreds of times before. 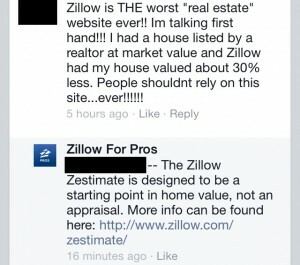 Zillow doesn’t seem to use any sort of auto response program, but they take a very impersonal approach to customer feedback. There’s no sympathy or resolution given, just a generic response with a link to their website. A better tactic would have been to apologize for the customer’s dissatisfaction and provide a way to contact them privately. This is true for both positive and negative user comments. Small businesses typically aren’t swamped with pages and pages of feedback, so it should be manageable to provide some sort of response to tweets, reviews and the like. Try to offer a resolution to any complaints (a discount, one-on-one personal assistance, etc.). If that’s not feasible, a professional and polite response is always the right approach. Good feedback can be just as important to respond to. This is the difference between a former satisfied customer and a loyal one. If you’re seeking reviews to enhance your online reputation, be cautious. Yelp, for example, specifically prohibits users from soliciting reviews. Instead, provide follow up emails after purchases thanking customers for their business and let them know you’re on Yelp. Another thing you can do is add the Yelp button on your email signature, next to your other social signals. If your company’s social media management is done in-house, make sure all employees that are page administrators know the basics of communicating on these platforms. One bad comment could end in a PR disaster. Have something to add? Tweet us @TECKpert.